Booking: We have plenty of space so you don't need to book in advance although are welcome to do so. Please get in touch if you have any questions. Tariff: We charge per person. There is no additional charge per pitch (caravan, tent, or motor home). Please remember that our reasonable prices reflect that we do not have washing facilities. 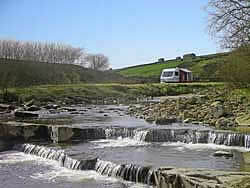 Unoccupied caravans: You are welcome to leave your caravan unoccupied at £2 per night at your own risk.